After a few months of hosting some less formal events, our most recent dinner party duties gave me the urge to set a more purposeful table. You know I love whimsy, as witnessed in the Brunch Table Setting, but I wanted more structure and a tad more elegance this go around. As I rummaged through my tablecloths and napkins to see what I could find I unearthed just the right ones. A few years ago while traveling in Italy, I purchased a tablecloth from one of the street vendors who brings textiles from Africa. I fell in love immediately with the bold yet earthy tones against the striking graphic print. Perfect choice to grace my table. To continue on the African theme, I pulled out large hand carved wooden napkins rings that I purchased decades before. Back then, my tablecloth collection didn’t support such a purchase but I knew these would serve me well in the future. (If I only invested my money as well as I invest in “stuff futures”.) These unique napkin rings are among the most prized items I have collected over the years. I love using them because they make an undeniable statement. Who knew that this eclectic acquisition I procured so long ago at a Saks Fifth Avenue sale would be the star of so many table settings. The face feels so peaceful to me. Pulling out the elements to this African Flare table setting. I opted not to use the orange napkins. I wanted to tablecloth to stand out and go with a more neutral napkin. It’s evident that the tablecloth has a lot going on, so the flowers needed to be bright, a single color, and single variety. In this case, the simpler the better for the florals. I still wanted them to make a statement but decided not to create a single centerpiece. Another way to create impact is with multiples of the same. I chose all glasses vases to keep it as clean and understated as possible. I didn’t want the vases to be the attraction. I chose varying heights and sizes for visual interest and then just filled them up with white roses. The purity of white roses is undeniable. Their elegance imparts immediate sophistication. As I mentioned, the tablecloth print had plenty going on. Now, you also know I’m a big fan of using some sort of runner to focus the eye. So no shocker that I found a large linen remnant in my stock and fold it down the center of the table. I felt it broke up some the pattern and gave the eye a place to pause as well as provided an ideal location for all the flowers and candles. My deeper plot was convincing JuanCarlos that those items would remain at the center of the table during dinner and that we would plate the food instead of family style. For once I wanted my table design to remain in tact while dining. The hostess has to have it her way, at least once in a while. The runner has golden tones to it that will work well with the gold notes on the plates and chargers. Without even realizing it, I noticed that the candle sticks also fall in step with an Africa vibe. I love using chargers when I set a formal table. It adds a touch of special while grounding the place setting, especially if you are not using a placemat. Sometimes, I use both but there was already plenty going on on this table. The warm tones of the cloth begged for a few gold accents which the plates offered, plus added the sparkle I was looking for. Besides the African Flare motif, it dawned on me that there was a secondary, underlying theme in the works. That of culling together disparate items collected over decades from various locations. So into the basement I went to dust off the mustard yellow water goblets I snagged at a vintage shop years ago. The tones worked perfectly with the color scheme and nestled up nicely against the white and red wine glasses. And there you have it. A more formal table setting with Africa Flare with finds from all over the place that didn’t feel too precious but still gave a sense of elegance. And although this may not be a traditional Easter table, I don’t see why this idea couldn’t grace your table for the upcoming holiday. Since I pulled together pieces not only from different stores, but from different countries and different decades, I realize that you might not have these pieces in your arsenal. How many of you collect tablecloths, material swags, napkin rings and vintage glasses for decades? (Or maybe you do and were looking for a way to bring them altogether! Someone after my own heart.) But if not, I wanted to provide some help. I did a little bit of research in case you wanted to achieve a similar look. Below are a few links to help you achieve the same look. I hope you found some of these links helpful in sparking ideas how on to mix and match, use blankets for tablecloths or just plain combine an interesting layering of cloths to create an African Flare table setting. Organization is my thing. I love being prepared, having everything ready to go, having lists and knowing what needs to get done. There’s is nothing more satisfying than checking items off the list and a sense of reaching the finish line. It’s actually a big joke ‘round these parts - “Dana, what’s next on the list?” Laugh all you want, I can take it, but rest assured I will never leave something undone or left at the back of the refrigerator… unless I choose. So, no shocker that pre-thinking the table and platters is part of my to do list. Having a plan of attack makes any job easier. And it’s no different when entertaining. All the same rules apply. Of course, you’ve read previous posts spouting the importance of pre-pro (that’s short in the TV world for pre-production) in the food prep area, or in culinary terms mise en place. Certainly having all your food prepped is vital but it’s equally important for setting up the final table, all the platters and serving utensils. Decades ago when I entertained, I had one set of dishes and very few serving items. So it was a tad simpler. Now that I have more of everything, I have more options which can be overwhelming. But even if you only have a few items from which to choose, you still need to make those work for you in the best ways possible. That’s why envisioning the entire event can actually shave time and energy in the long run. Ask yourself, what should the table look like and what platters or bowls should be used to make the day of party flow easier? Putting some thought to this prior to is one less task that needs to get done right before guests arrive. I thought I would share with you a carefree table setting, the platter choices and arrangement that I did for a recent brunch. As a matter of fact, that gathering was originally slated for a Saturday evening but we needed to reschedule. Our new date landed us on a Sunday midday; perfect for brunch. No formal table setting for this brunch. Nor a fully covered table. It’s well documented that I love putting a table cloth down, but for this sunny, brunch buffet that felt too stuffy. Whimsy was my main goal. 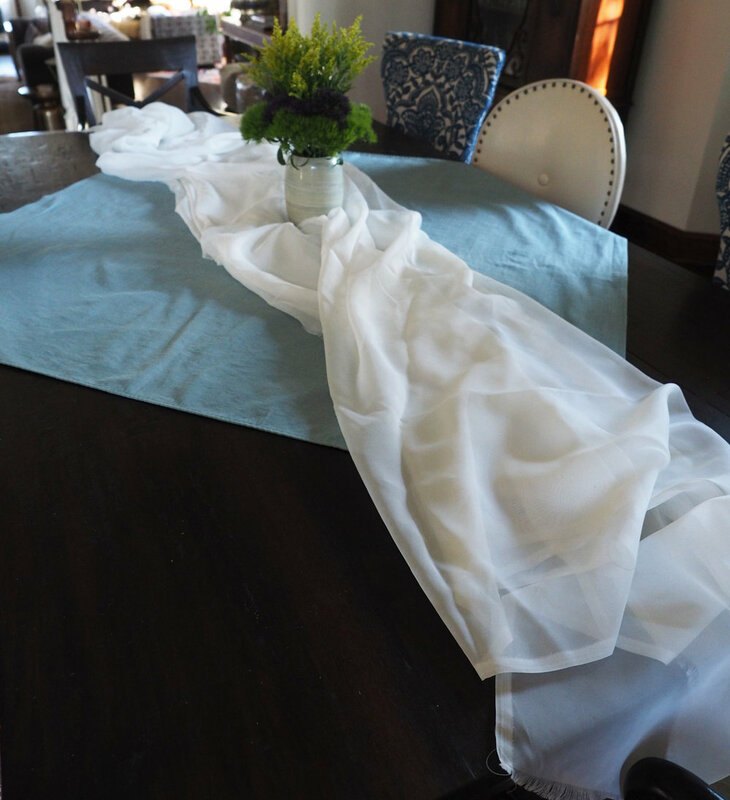 So, I used a small square light blue tablecloth and placed it with the end points on the center of the table, leaving the ends of the table exposed. Then for movement and visual interest, I tossed a swath of white sheer material down the length of the table. Thus creating the exact vibe I intended. Both haphazard yet purposeful, it softened the whole table. It actually drew the eye to center of the table. Now I had a landing strip for the food platters. With the variety of food I had planned, I knew there would be a lot of platters occupying space, so I opted for a very simple and small floral arrangement. Using only filler florals that I found at Trader Joe’s, I arranged the three different florals in a color blocking, circular manner to create a bright, burst of life. Total of $9. I placed in the center, and knew that the colors would be the inspiration for for the platter choices. Bold, bright, contrasting and complimentary colors. I grabbed simple rustic, cotton cloth for napkins for an relaxed Sunday vibe. In my drawer of tricks I found 6 lengths of ties, 3 different colors that all coordinated and played nicely with the overall color theme. Can you identify what these ‘strings’ are from? If you guessed the handles from clothing shopping bags you would have been correct. 3 different bags, 2 ties each of harmonious colors. For all those who say, don’t save stuff, I say BooHoo to that. These were perfect in every way. There is an art to seeing the usefulness of an item that you would normally toss away. I decided to create napkin pockets by stacking a knife, fork and spoon together. The equivalent to a 3 way spooning situation. Then I placed them in the center of the folded napkin and gathered up the material around it like a flower petal. Using the string, I tied them together about 3/4 ways up to create a flower like pocket. Next… how to corral them. I remembered I still had a basket with leftover pinecones in it. Perfect for an organic feel. I kept the pinecones stacked on one side and lined the napkin ‘florals’ in the basket placing it next to a stack of white dinner plates for a grab and go station. This is really where the menu plan meets the serving plan. Think about your menu. Think of the amounts of each item you plan to serve, then pull some platters and see what works and looks good together. Once I have a good sense, I then place them in the position on the table to review the flow. Wanting to bring color and pizzaz to the table, I pulled out my most colorful, playful platters. The round fish plate would be for salmon burgers, the blue fish bowl for the relish, the long rectangular for the mini buns and purple cake stand for the traditional Spanish tortilla. I like culling food items that go together in a ‘station’. This is accomplished simply by huddling them on a board, tray or platter and use smaller bowls within. Given that I had a few offerings for the guests to create their own yogurt parfait, a yogurt ‘station’ was a must. I chose a small wooden board for a rustic feel, then to invite color and whimsy, I chose two different bowls in the similar color scheme. One for yogurt and one for granola. Instead of cereal bowls, I stacked glass, stemless martini glasses for yogurt parfaits. Toss some fruit around and you now have a Yogurt/Granola Station. Place all the platters, boards around the table to make sure there is good flow and visual interest. Move them around until it feels right to you. I kept most of the platters toward the center leaving room if our guests wanted to sit at the table to eat. We all opted to pile our plates and eat by the fireplace in the living room. Sure it’s lots of color, and different styles but the blues and hues unite them. The end result should be an inviting burst of tantalizing offerings that entice your guests to continue wandering around the table to pick and nibble away. Bruce and Maryann eyeing the offerings and creating a sumptuous plate of good bites. Our guests did just that. Hopefully, this inspired you to create your own buffet table scape. I guarantee that having all the platters and the table pre-set will be a blessing not a chore. Side note: I didn’t mention beverage station, but we always have one. If you look over MaryAnne’s right shoulder in the photo above you get a glimpse of the sparkle of glassware. We have a credenza that we use to house all the glassware and beverages as a self serve station. If you don’t have a credenza, add a small folding table, or carve out some space on your main buffet table. The idea is to have all the beverage items together to make it easy for your guests to serve themselves. It’s springtime folks, Brunch is served!